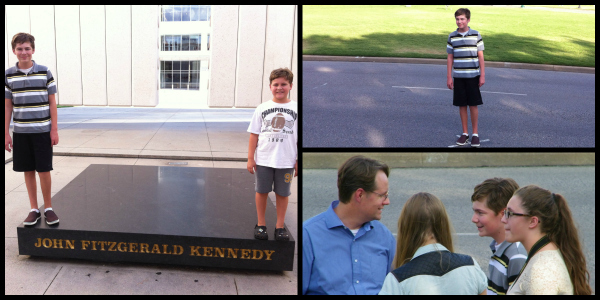 This year my wife and I were able to visit three sacred places with our children: Ford’s Theater in D.C., the Lorrain Motel in Memphis, and Dealey Plaza in Dallas. All three places are preserved just as they were on those ill-fated days when Lincoln, MLK and JFK met their premature deaths by an assassin’s bullet. In one of the pictures above you see my oldest son standing on the actual spot where Kennedy was shot. There is an “X” painted on the road. On that spot a 46 year old man died who was born in Massachusetts, attended Harvard, served in the Navy, was elected to Congress, the Senate and then the Presidency of the United States. On that “X” his life ended. The place, the spot, the moment in which my life will come to an end. I am confident that God knows that exact spot. It may be somewhere I have tread a 1,000 times or it me be 1,000 miles away from everything I’ve ever known. I can’t live my life constantly thinking about the “X”, but I dare not live my life forgetting about the “X”. I can only do my best to live honestly, purposefully, selflessly, nobly before I reach that fateful spot.